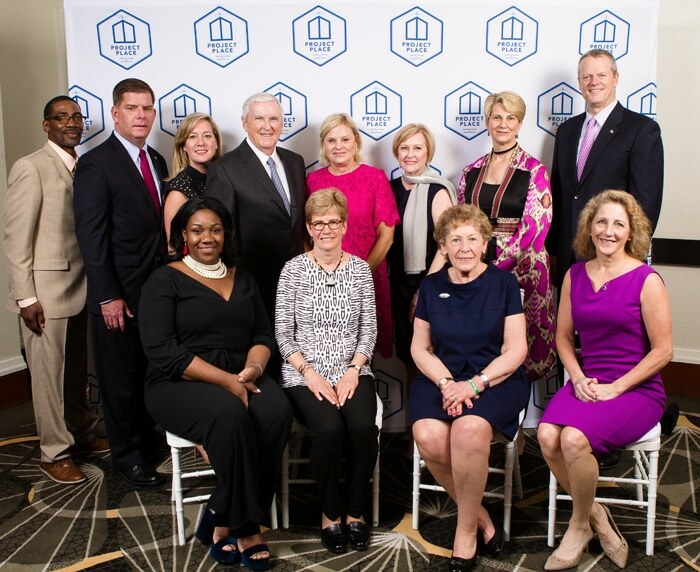 Photo: From left to right, top row: Gilbert Costen, Mayor Martin J. Walsh, Lorrie Higgins, Jack Connors, Eileen Connors, Mary Kelleher, Heather Wells, Governor Baker; bottom row: Amefika Desir, Suzanne Kenney, Angela Menino and Lauren Baker. Boston, Mass. ― More than 250 friends of Project Place gathered last night to celebrate the dedication of clients to finding employment and moving from homelessness to a stable life. The event raised over $860,000, which will go toward funding job training programming and social enterprises. Alumnus Amefika Desir spoke at the gala about how Project Place helped her get into the field of healthcare and succeed in the interview process. “You need to be committed, you need to do your part, but Project Place will be there for you,” she stated. Following Desir, Alumnus Gilbert Costen, a veteran and supervisor at the City of Boston Public Works Department, shared how “Project Place gave [him] hope back.” He spoke about how the skills he learned in Project Place’s janitorial social enterprise helped re-instill positive work values in him. Major sponsors for the 2018 Open Door Gala included: Eileen and Jack Connors, Highland Street Foundation, Michele and Howard Kessler, Eversource, John Hancock, Mary Kelleher & Kevin Leary, and Gerry Martin. Honorary Chairs included Governor Charlie Baker and Mrs. Lauren Baker; Mayor Martin J. Walsh & Ms. Lorrie Higgins; and Mrs. Angela Menino. Gala co-chairs included Eileen Connors, Mary Kelleher and Heather Wells. Founded in 1967, Project Place has provided hope and opportunity to individuals who are homeless or low-income in the Greater Boston area for 51 years. The nonprofit is a supportive community that provides the education and resources needed to obtain stable employment and housing. Project Place manages social enterprises (small businesses with a social mission) that offer employment opportunities and also offers job training programs, career services, transitional and permanent housing, and case management support to help those experiencing homelessness reestablish themselves in society with dignity. For more information on these and other programs, visit projectplace.org; follow us on Twitter at @Project_Place and on Instagram at @ProjectPlaceBoston; or “like” us on Facebook at facebook.com/ProjectPlaceBoston.